The conglomerate slashed its dividend to a penny – from $US0.12 a share. GE also took a pretax $US22 billion noncash goodwill impairment charge related to its power business and said it’s splitting the unit in two. The conglomerate reported adjusted earnings of $US0.14 a share on revenue of $US29.57 billion, missing the $US0.20 and $US30.25 billion that analysts surveyed by Bloomberg were expecting. 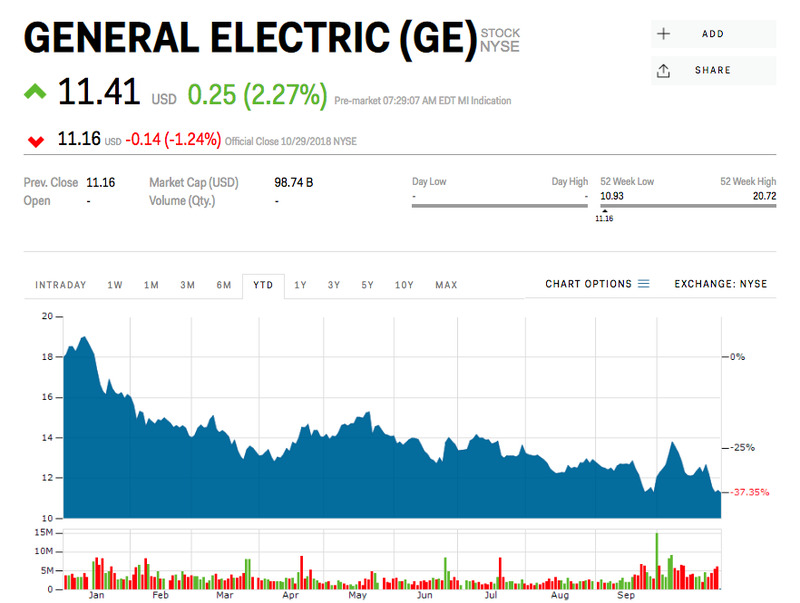 GE said it would slash its dividend to $US0.01 a share – from $US0.12 – saving it approximately $US3.9 billion of cash a year. The company will also take a pretax $US22 billion noncash goodwill impairment charge related to GE Power and split the unit in two – a unified Gas business and a second unit made up of the portfolio of GE Power’s steam, grid solutions, nuclear, and power conversion assets. “After my first few weeks on the job, it’s clear to me that GE is a fundamentally strong company with a talented team and great technology,” CEO Larry Culp said in the earnings release. It has been a rough year for GE stockholders, who have seen shares plunge more than 35%. After a gain of more than 20% following the naming of Culp as CEO, the stock has proceeded to make new lows. It hit less than $US11 a share on Monday, making for its lowest print since the depths of the financial crisis.